If I could be anywhere in the summertime, I would chose the south of France. More specifically, Marseille. Sure, it gets crazy hot, and as a city, it gets a bad rap for being dangerous and dirty, but if you take the time to look just beneath its deceptively rough surface, you will find that France’s second largest city is also charming and vibrant, full of colour, life and soul. In my opinion, the best way to experience this soul is through its food, and trust me, I have eaten plenty of it in Marseille. However, the one thing I always come back for is probably one of the simplest dishes. Panisse is often associated with the south of France, but from what I understand, it actually originated in Italy. It is essentially a paste made from water and chickpea flour that is cooked and chilled before being cut into slices or fingers and fried. The resulting “fries” have a crispy exterior and a delightfully soft and creamy interior. Panisse can be served as a side for grilled meat or even in a salad. They are excellent dipped in garlicky aioli (or any other kind of mayo for that matter). But the simplest way to eat them is probably my favourite: fresh from the pan, sprinkled generously with flaky salt and freshly cracked pepper. On a hot summer’s day, a cold glass of pastis in one hand, these in the other – now that is a Marseillais recipe for success. The first time I mixed up a batch I was worried that the batter stayed a bit lumpy no matter how much I tried to whisk it. I discovered, however, that those little lumps of flour eventually hydrate evenly so not to worry. The most important thing to pay attention to is the time you take to cook it. That being said, this recipe definitely takes a bit of effort (and by that I mean elbow grease). The paste needs to be thoroughly cooked out in order to develop the correct texture and flavour and this can take up to 15 minutes of stirring! So do yourself a favour and put on a great playlist you can groove to before getting started. Your tired arms will thank you for the distraction! Lightly grease a square baking pan and set aside. Heat the water, salt, olive oil, black pepper and paprika in a pot to a simmer. Allow to cook for 1 minute. Gradually whisk in the chickpea flour. Cook on medium-high heat for 5 minutes, whisking constantly. Turn the heat down to medium-low. Switch to a wooden spoon or spatula and continue to cook for 10 minutes more. The resulting paste will be shiny, snappy sounding and quite thick in consistency. Scrape the cooked paste into the prepared baking pan and spread evenly. Cover the surface with plastic wrap and allow to cool at room temperature for 20-30 minutes before continuing to cool in the fridge for least 2 hours before slicing. Best results if you allow to cool overnight. Heat ½ cup olive oil in a skillet on medium heat. 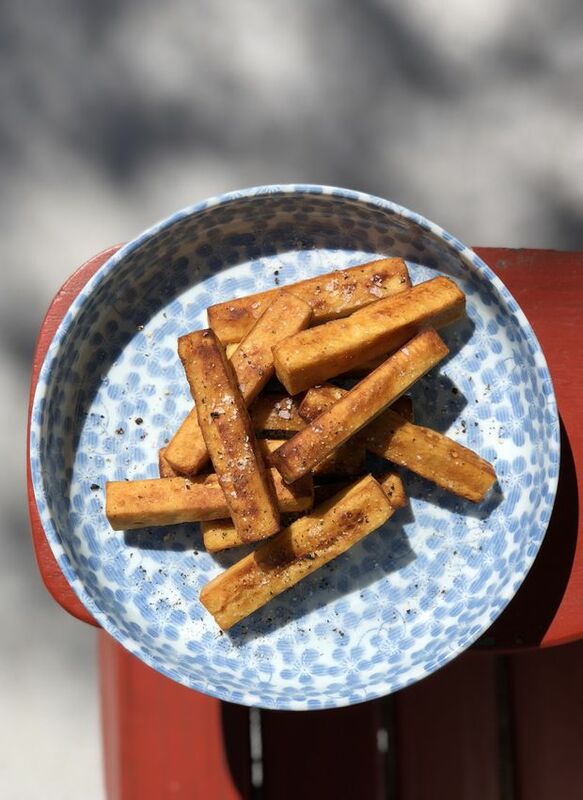 Cut the panisse into bite-size slices or fingers and fry 6 to 8 pieces at a time. Turn each piece every minute or so until they are golden on all sides. Remove from pan and place on a paper-towel lined tray to soak up an excess oil. Serve on a platter or piled high on a large plate and garnish generously with flaky sea salt and freshly cracked pepper. Serve immediately.